Child of Aphrodite, and her assistant in promoting love matches among gods and mortals. 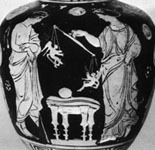 He is shown as a winged youth, becoming a baby after the 4th century BC, and his weapon is the bow, or sometimes a whip. Otherwise he appears with ordinary youthful attributes - a hare, hoop. He is sometimes shown in art at mortal occasions such as marriages, and regularly with Aphrodite. On his own he represents the power of sexual attraction. In later art the figure is often multiplied, and two erotes may be weighed against each other by a woman in a love ritual, shown (as here at middle image) on some classical vases (Erotostasia). 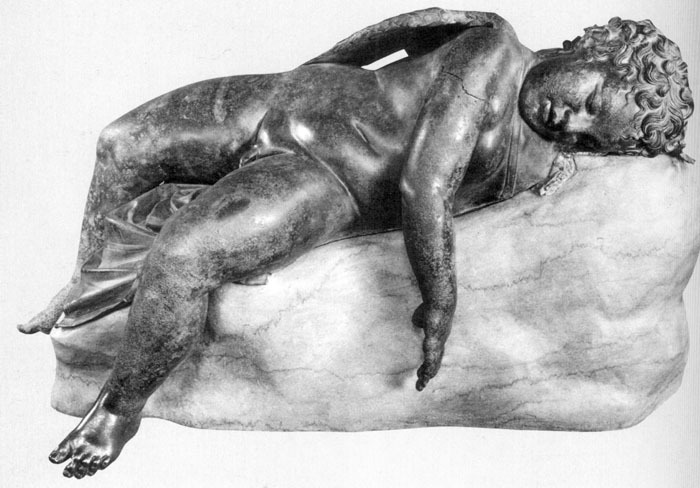 He is often indistinguishable from Pothos or Himeros who personify similar emotions (yearning desire).